The artificial sweetener aspartame, originally made and forced on the market by Monsanto Corp., is a neurotoxin and is damaging people's health, allege three separate lawsuits filed in different counties in California. Defendants in the lawsuits include Coca-cola, PepsiCo, Bayer Corp., the Dannon Company, William Wrigley Jr. Company, ConAgra Foods, Wyeth, Inc., The NutraSweet Company, and Altria Corp. (parent company of Kraft Foods and Philip Morris) and WalMart. An unexplained epidemic of sudden cardiac death in the US may be due to the widespread use of the sweetener in "light" soft drinks, yogurts, chewing gums and bakery wares for diabetics. The FDA has blamed ephedra, a herb, for the deaths of several sports celebrities, that may in fact be aspartame related. The National Justice League made the announcement on 6 April 2004. SACRAMENTO-- April 6th, Lawsuits were filed in three separate California courts against twelve companies who either produce or use the artificial sweetener aspartame as a sugar substitute in their products. The suits were filed in Shasta, Sonoma and Butte County, California. Aspartame is a drug masquerading as an additive. It interacts with other drugs, has a synergistic and additive effect with MSG, and is a chemical hyper-sensitization agent. As far back as 1970, Dr. John Olney founded the field of neuroscience called excitotoxicity when he did studies on aspartic acid, which makes up 40% of aspartame, and found it caused lesions in the brains of mice. He made world news on the aspartame/brain tumor connection in 1996. Dr. Ralph Walton, Professor and Chairman of the Department of Psychiatry, Northeastern Ohio Universities College of Medicine has written of the behavioral and psychiatric problems triggered by aspartame-caused depletion of serotonin. Dr. Woodrow Monte in the peer reviewed Journal of Applied Nutrition, Aspartame: Methanol and the Public Health, wrote: "When diet sodas and soft drinks, sweetened with aspartame, are used to replace fluid loss during exercise and physical exertion in hot climates, the intake of methanol can exceed 250 mg/day or 32 times the Environmental Protection Agency's recommended limit of consumption for this cumulative poison." Since its discovery in 1965, controversy has raged over the health risks associated with the sugar substitute. From laboratory testing of the chemical on rats, researchers have discovered that the drug induces brain tumors. On Sept 30, l980 the Board of Inquiry of the FDA concurred and denied the petition for approval. In 1981, the newly appointed FDA Commissioner, Arthur Hull Hayes, ignored the negative ruling and approved aspartame for dry goods. As recorded in the Congressional Record of 1985, then CEO of Searle Laboratories Donald Rumsfeld said that he would call in his markers to get aspartame approved. Rumsfeld was on President Reagan's transition team and a day after taking office appointed Hayes. No FDA Commissioner in the previous sixteen years had allowed Aspartame on the market. I hope this all isn't true but it sure does look like it. Why does the government allow this to happen to our people? 1. The link to National Justice appears to not work. 2. Have there been any UPDATES on the LAWSUITS against Aspartame-Pushers? If so, please update this site, if possible. 3. The more exposure to the TRUTH about the hazards of aspartame, the better. Please keep this site alive and updated, as many of the former sites appear to no longer exist. 4. Does anyone know what if any DENTAL PRODUCTS contain aspartame? The same question applies to NON-EDIBLE PRODUCTS such as household air fresheners and cosmetics? blind in 1998, causing a CRVO, central retinal vein occlusion); and I can even SMELL IT when exposed to it! I suspect that the dental polish used by my dental hygienist has ASPARTAME as an ingredient (you can tell by the fake strawberry flavoring!). Also, my EYE DOCTOR's office uses a creepy AIR FRESHENER that I suspect contains ASPARTAME (you can smell that same fake fruit-flavoring in the air), which always makes me wonder WHAT THAT CR*P is doing to my eye pressure when I go there to have it measured! Please POST HERE if anyone has any input on all this. I've been a diet-colaholic for the better portion of the last 15 years. I have highly irregular menstrual cycles, fibrocystic breast disease, fibromyalgia, migraines, chronic dry-eye, hypoglycemia, and in the past year or so, massive mood swings, and what I call "cerebral flatulence". I lose track of things mid-thought. After reading all the information on aspartame, I believe that eliminating it from my diet may reverse a lot of my symptoms, however, are there any resources on how to detox yourself from aspartame? Support for withdrawal symptoms? I have tried to quit previously, but I am determined this time. It would take far too long for me to go into my whole history of illness and the effects aspartame has had on me. I will say, that I, a mother of three young girls at the time, was diagnosed in 90 with ALS at the age of 29. Then after an unexpected 'recovery' from that, I continued experiencing physical setbacks. In 2001 I lost my voice for what would be over two years. Throughout the many tests, neurologists, etc., no known cause could be given for my varied symptoms. Through an aquaintance of my daughter I was given the info that it could be caused by diet coke, of which I had drank on a daily basis for over at least 13, 14 years. After researching online about aspartame, of which I had no knowledge previously, I quit drinking diet coke immediately and one month later my voice returned and many of my other physical symptoms dissipated. I have NO doubt that aspartame was to blame for my illness. In fact, I feel my life has been terribly affected, from working (the inability to), raising my daughters, being a complete functional human being. So I am angry. And I still am limited when it comes to what I am capable of physically...and yet, who's going to listen? Or care? Not the gov't...because my condition had no known cause, they basically denied disability during that period and made it impossible for me to afford medical insurance, etc., etc. So, at this point, I'm trying to somehow get my life together and I really don't want to feel that all I've been through has been for naught. And it's a shame that topics such as this are pushed aside, or made out to be 'ridiculous', because it's basically a no-brainer. 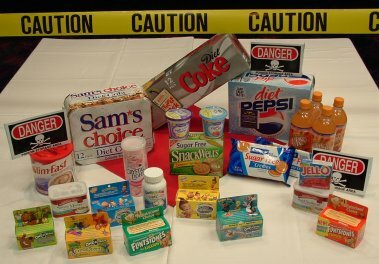 You put chemicals and additives, poison, into your body, you will get sick. Some more sick than others, and some die. And parents let their children drink diet sodas, eat sugar free foods and wonder why their children have health problems, are overweight...it's because of ignorance. Just as I was ignorant. And the truth of the matter is, we are what we eat. And there is no doubt in my mind that if I'd known what could happen to me because of something so commonplace and accepted as diet soda and whatnot...I would've thought twice. But, I was not aware, and basically was poisoning myself to death. I feel I've been cheated out of a large period in my life because somebody needs to make a buck at whatever expense...even if it means another person's life. I have been using nutra-sweet in my coffee,breakfast cherri-O's since college. Do I need to worry,and if so, who do I contact? I have drank Diet coke and Diet Pepsi since I was 13 years old. I am now turning 28. For about 5 years I have been in the ER about once a year with no explaination of why I have felt the way i have. They tell me I am perfectly healthy. This I know is wrong. I feel horrible. In november 2005 I went into the ER again and did not think I was going to make it another day. They diagnosed me with anxiety. In December I was back in the hospital and they diagnosed me with arythmia of the heart. I saw the news May 8, 2006 on the dangers of Aspartame and poored out all the diet Pepsi I had in my house.In a way i feel releived because i have finally found an explanation of all the symptoms I have had. And then again the more research I do the madder I get that the FDA has let the US consume a POSION! Here is what has happened. Picture how much aspartame has been sold around the world since the 80's. Billions of consumers of this sweet zero calorie chemical. that the FDA approved. Can you picture all of the lawsuits if the fda pulled aspartame. Oh my lord. They would be in a serious world of hurt. And what would they replace it with?? You ever wonder why they even came out with splenda? Why did they bother creating something else if nutrasweet(aspartame) was supposedly so good. And did you ever notice the diet coke splenda trials that nobody bought. It's almost gone now. This isn't vioxx here, it's nutrasweet. Sold to billions and consumed by everyone from pregnant women to children. I myself have been drinking it for the past 6 years. It's not until you start to consume 5 or more per day and you start to experience symptoms that resemble multiple sclerosis and baffle doctors. I've recently figured out why my health is so messed up. I invite anyone to go to the www.aspartame.org website and ask yourself why they made this site to defend aspartame??? If they are so sure how safe it is then why bother calming the concerns? And why are we concerned? We are gaining nothing from speaking the truth. We just refuse to sit back and be sick. They know the truth but can't afford to recall the product. It's an insanely tough position for them. Do you see websites specifically for aspirin and how safe it is?? Heck no!! I can't believe they made a website of frequently asked questions. Has anyone ever seen the MSDS(material safety data sheet) for methanol??? They openly admit that aspartame contains or converts to methanol and act as if methanol is harmless. And they state that it can't be absorbed by the body. Methanol is a serious poison. They add methanol to denatured ethanol at hardware stores so people don't drink it(ATF regulation). I hope someone battles these idiots and liberates us from this crap. I've been trying to quit drinking it but it is difficult and rather addictive. I live in Australia, and people are gobbling up the diet drinks etc like there's no tomorrow. Little do they know there WILL be no tomorrow if they continue taking that poison. I was chewing thru a couple of packs a day of the Wrigleys sugar-free gum, and like many others started suffering the huge fatigue, mental confusion, but the pain around the brain was the worst, which I tried to describe to my doctor, and as Doctors usually, he looked at me like I was a nutter. Then I read about it, stopped taking it, and took quite a bit of time to recover my brain activity. That was 7 yrs ago. Now I am suffering from fibromyalgia etc, which i believe from the hours and hours of research, that it is a neurotoxin (aspartame) which is one of the precursors to F.M. Went to a Naturopath, and she has helped me greatly with a powder containing magnesium/calcium/taurine/b vitamins that athletes would take for muscle recovery. The only concern with that is the amount of selenium. Please people be careful with the selenium amounts, it can be toxic. My brain fog and fatigue have lifted markedly, but the pain still dwells. But, I'm not taking this lying down!! I'll keep searching. Hope this helps. I was a fan of gum, untill I read the labels, they all have aspartame in them now with sugar, you would think so for sugar free but not the regular chewing gum !!! I too had a very long battle and addiction to a diet drink, diet coke. 7-8 cans and sometimes bottles a day for nearly 10 years. I know that artificial sweetners are bad for you because I expertienced the side affects. Headaches, Migraines, joint pain, fatigue and the list goes on. Well anyway, I broke my habit by accident and now my symptoms are all gone and I feel great. i'm drinking a pil for school. have the pil aspartame????????????????? THIS IS A VAIN ATTEMPT TO MAKE YOU ILL AND OF COURSE ( DEPOPULATE THE CONTRIES OF THE WORLD.